Dudley Council has suspended one of its officers over allegations that he posted anti-Semitic material on Facebook. Mr Jonson attended the protest outside Ian Austin's constituency office. Paul Jonson, an anti-social behaviour officer at the authority, has been accused of violating the International Holocaust Remembrance Alliance (IHRA) definition of anti-Semitism with a post describing Israel as a ‘racist endeavour’. 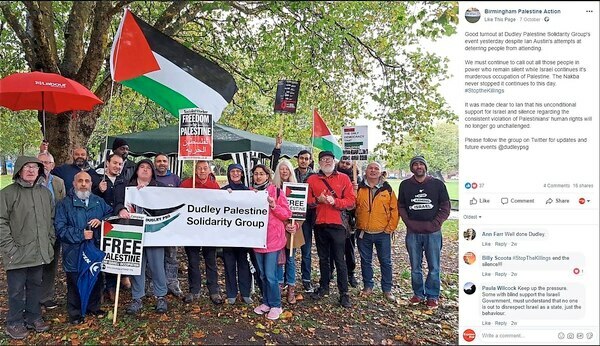 It refers to a protest outside Dudley North Labour MP Ian Austin’s constituency office on October 6, where placard waving activists demonstrated against Israel’s ‘murderous occupation of Palestine’. The council, which signed up to the full IHRA definition last year, acted following an official complaint from the Campaign Against Anti-Semitism. Bosses ordered Mr Jonson to stop attending work while an investigation is ongoing. 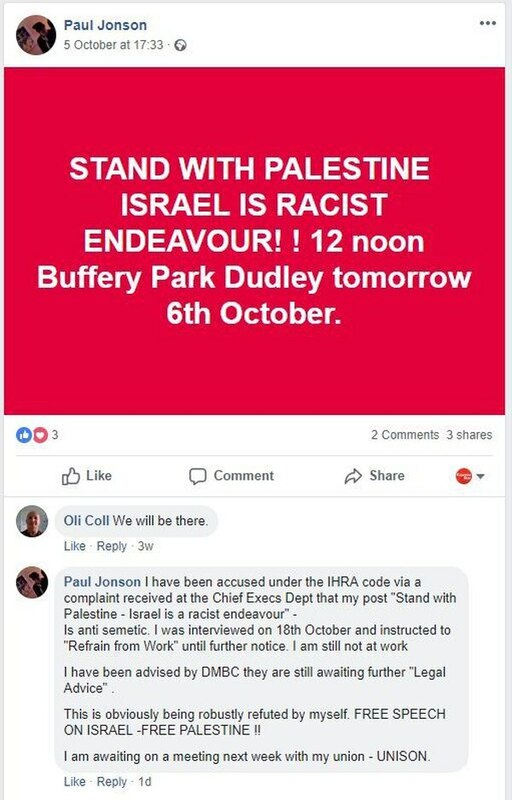 Mr Jonson, who attended the demonstration, posted on Facebook: “I have been accused under the IHRA code via a complaint received at the Chief Execs Dept that my post “Stand with Palestine - Israel is a racist endeavour” – is anti-Semetic (sic). “I was interviewed on October 18 and instructed to ‘refrain from work’ until further notice. I am still not at work. “I have been advised by DMBC they are still awaiting further ‘legal advice’. He added that he was planning to meet with his union, Unison, to discuss the issue. 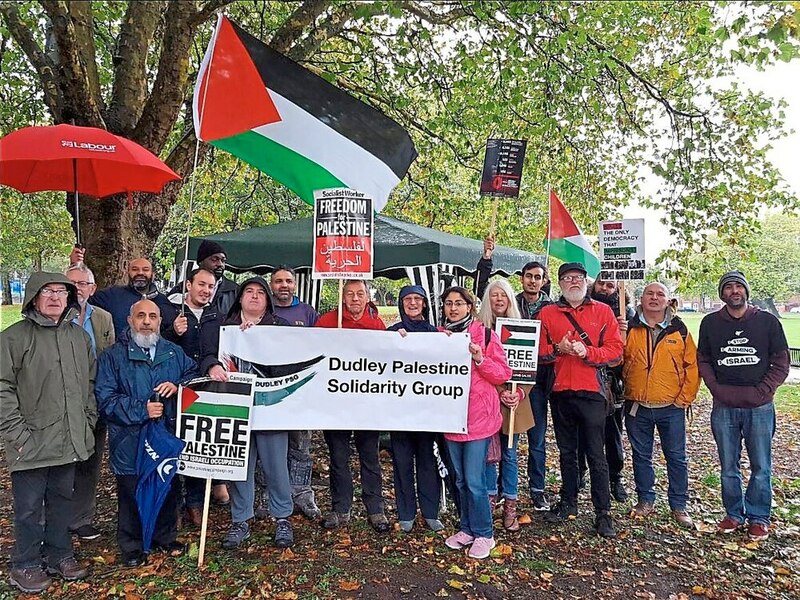 Stephen Silverman, the director of investigations and enforcement at Campaign Against Antisemitism, has called for Mr Jonson to be sacked from Dudley Council. He said: "Mr Jonson seems to be intent on baiting the Jewish community by breaching the International Definition of Antisemitism. "His appalling behaviour shows that he is utterly unfit to hold the office of Anti-Social Behaviour Officer for Dudley Metropolitan Borough Council. 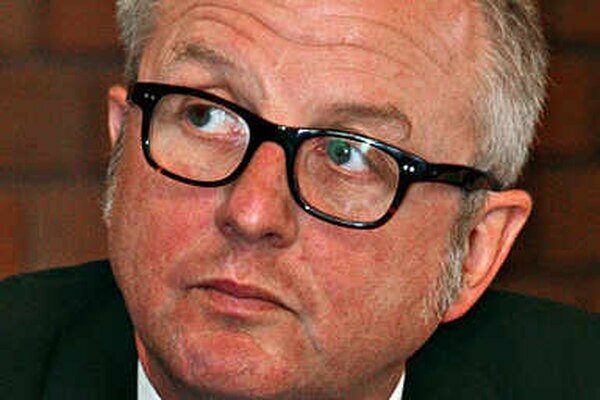 Mr Austin was targeted by pro-Palestine campaigners over his stance against anti-Semitism in the Labour party. He has been an outspoken critic of Jeremy Corbyn’s handling of the issue, which saw the party embroiled in a series of rows with Jewish groups over the summer.